I have resisted putting up a page about me for a long time but just to sort out any confusion I thought it would be sensible, as many people assume my name is Androula? This blog was set up to promote my book Androula’s Kitchen- Cyprus on a Plate which I named after my cousin because it was she who inspired me. 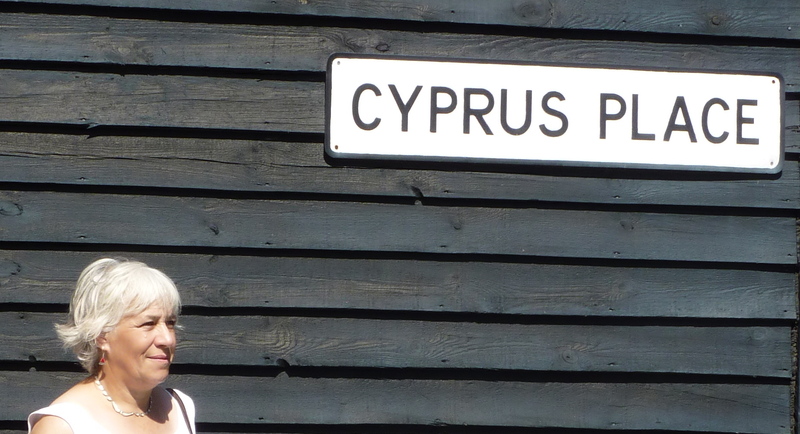 My name is Sonia Demetriou I was born in Walthamstow, London to a Cypriot father and an English mother I now live in Sussex and have done for nearly 40 years. I have worked as a restorer of painted furniture and a specialist decorator of furniture and whatever else came along, since I left school at 16.This has included painting floor panelling to look like stone and marble, walls to look like gardens, and many many highly decorated harpsichord cases that have gone all over the world. I started off in an apprenticeship at first in a studio in Chelsea then,after several years I set up my own studio in Sussex purely so I could get out of the commute from north-east to south- west London every day which took a huge chunk of time. It has been such a large part of my life working with paints and colour and dust but then life took a bit of a turn in a different direction and I ended up writing a book. Just like that, no warning it just popped into my head after visiting my cousin. Life is full of surprises! I am still exploring and learning about Cyprus and I like to discover new places and people to write about as well as take photographs. In 2015 I’m planning a special six month trip where I hope to experience the beauty of the Spring and the wonder of Easter as well as make new contacts. If you are enjoying the site and are interested to read more blogs why not consider donating a small sum on the Donate page and get a complimentary copy of Androula’s Kitchen in PDF format to view on your iPad! Thank you. How lovely to find this blog (via TripAdvisor whilst researching another trip to Cyprus for later this year). I met you when my husband and I stayed at Androula’s house in Spring 2010, and you were there researching your book. – I often wondered if you had published it. We ate some wonderful food and loved our time in Tres Elies. Looking forward to reading your book. Hi Jan, yet again I didn’t see this message when I was away so I’m glad you found me and how interesting via Trip advisor! I do hope you enjoy the book. It is available in many outlets in Cyprus when you go you may stumble upon it. I also have a Facebook page. Best Wishes Sonia. The book is beautiful, and lots of good insight into the Cypriot ways. I will feel well informed for our next visit. Many Thanks Jan. I’m glad you are enjoying it. By the way it is even better in paperback!!! Best Wishes. Sonia. Why do you need to call me Adriana? If you tell me I may be able to assist.